The United Nations Security Council can take decisions that will force members of the UN to comply. They can also mandate the use violent means to maintain international peace and security. Such a decision is called a resolution. The veto is a mechanism that allows the most powerful countries of the post-World War II era to block a resolution in the Security Council from getting adopted. The United Nations Charter gives a de facto veto power to the permanent five members of the Security Council, but because of the wording of the Charter, a permanent member cannot vote against a resolution without vetoing it. Instead, a permanent member can choose to abstain from voting to show dislike for a draft resolution, without actually vetoing it. The veto’s existence came from a strong notion that all the major powers from after World War II must be part of the United Nations, but due to fear of each other they were granted this power – and thus avoided the risk of a majority in the Security Council infringing on their statehood. 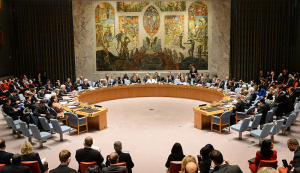 The United Nations Security Council plays an extraordinary role in international relations. It is the only body in the United Nations that can decide on the use of violent means. It is tasked to do so when it is necessary to maintain international peace and security. To do this, a resolution must pass in a session with the Seurity Council’s fifteen members. Five of those members play a particular role in the Council. They are the Permanent Five – or P5 for short. Unlike the rest of the Council, their membership does not change hands every two years and they have been part of the Council since its inception. There are fifteen members of the United Nations Security Council. 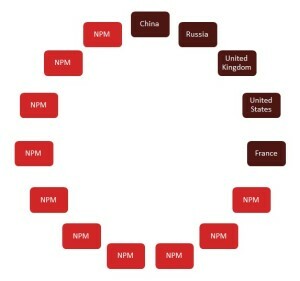 Five of them are permanent members – The P5 – and the others are non-permanent members (here denoted by “NPM”) whose membership is limited to two years at a time. After that time, the membership of the Council is reelected. “1. Each member of the Security Council shall have one vote. This means that in any non-procedural matter, a decision is made if two criteria are met. First, nine of the Council’s fifteen members must vote yes. Second, none of the P5 must vote no. A P5 member can show its disapproval either by abstaining from a vote or by voting no, effectively making a decision impossible. In other words, a P5 member cannot vote no and still allow the decision to pass. There is no option for the P5 to choose the veto over a no vote; they are one and the same. To avoid the issue of blocking something acceptable, but less-than-optimal, the P5 have repeatedly resorted to abstentions. One of the permanent members may, for instance, wish that a resolution does not pass, but is unwilling to be seen as against its main points. This was likely the case when Russia and China abstained from voting as the Council decided on the controversial Resolution 1973, allowing the use of force against Muammar Gaddafi’s regime in Libya. Where did the veto come from? The United Nations was not the first attempt at an international organization with the mission to promote international peace and security. In the period between the World Wars, there was the League of Nations. The LoN was plagued by problems arising from both a distrustful climate in international relations and from how the organization was set up to work. Among its problems was a consensus-based voting procedure, in the forerunner to both the Security Council and the General Assembly. This meant that all members of the League had a veto. The LoN collapsed with the onset of World War II. As the second half of the 1940’s approached, however, there was an initiative to once again try to cooperate internationally to avoid war. The end of the war meant that there was an opportunity to do just that. Wise from the experience of the League, the founders of the UN restricted the veto considerably. The most powerful states at the time (today’s P5) were key to making the new organization work. The United States had not been member of the League of Nations, despite President Woodrow Wilson being one of the main initiators. This meant that the LoN never reached the acceptance it needed to take forceful action. If this was to be avoided, the founders of the UN had to make sure that all the major powers were onboard. Those states, however, were distrustful of each other and did not want to put important decisions of security into the hands of a possibly hostile majority in the Council. For that reason the veto remained, but only with five member states. The rest of the membership of the UN has never been diplomatically strong enough to successfully gain the veto right. This is part of why the United Nations is much more successful than the League of Nations. It is, however, not a particularly effective system. Vetoes are used for other reasons than to protect the security or sovereignty of the P5, such as protecting lesser interests or allies. See our report, Legitimate Concerns, for more information about how the veto is used by the permanent members.